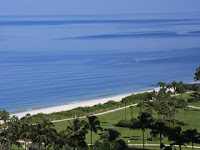 Penthouse level condominium for sale in Bay Shore Place at Park Shore in Naples Florida. Views on the Gulf and the bay. This condo is for sale furnished. Bay Shore Place is one of the newest building in Park Shore, has been renovated and offers great amenities and direct access to the beach. At walking distance to Venetian Village. Open Sunday 10/19 - 2 to 5PM.